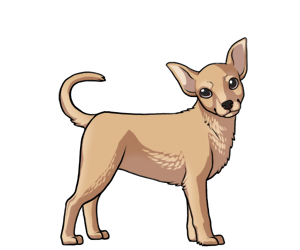 The Chihuahua's history is still relatively unknown but it is believed the the breed is one of the oldest on the continent of North America. The breed likely originated in Mexico as a companion dog as far back as the 1530. Many believe that the Chihuahua was derived from the fennic fox however the exact ancestors are unknown. Today the Chihuahua still functions as a companion and is relatively popular around the world. As of 2007, a Chihuahua currently holds the record for the smallest living dog in the world at 4 inches tall. Small chihuahua like dogs have been depicted in paintings as far back as 1480. Chihuahuas are the only breed of dog to be born with an incomplete skull.